Has time caught up with Big Papi? Coming into the season, the Red Sox hierarchy seemed to have determined the team could compensate for a questionable pitching staff with big bats. The front office may have presumed that with Mookie Betts and a healthy Dustin Pedroia as set-up men, the team would be scoring a lot of runs, figuring that no pitcher would want to face a heart of a batting order that had David Ortiz, Hanley Ramirez, and Pablo Sandoval. Then, they would throw at the opposition Mike Napoli, one of the right fielders, Xander Bogaerts, and then a catcher. The Sox have scored 178 runs, and their pitching staff, which even the bosses would have to admit has been a disappointment, has allowed 215 runs. With all the attention directed toward the weak pitching, some attention has to be directed toward the poor and inconsistent run production by the Red Sox bats. •	Betts has not been above .250 since Opening Day when he went 2-for-4. He has five home runs and five steals. •	Pedroia is a solid .280-something hitter, but he entered the season with a career rate of striking out once every 9.6 at bats, and this season that rate is once every 7.0 AB, with a 12.4 percent strikeout rate the highest of his career. Plus, he has a .190 batting average with runners in scoring position. •	Ramirez had a monster April with 10 homers and 22 RBIs; he’s had a miserable May, hitting .230 with one RBI. •	Sandoval has hit .347 against righties and .071 against lefties. •	Napoli in the last seven games has hit .440, bringing his BA for the season up to a less-than-robust .211. But of all the areas of concern for the Sox, perhaps the most troubling is the decline of their 39-year old designated hitter, David Ortiz. Can the Red Sox offensive woes be traced to the decaying production of the DH? After years of depending on Big Papi’s big pops, age and shifts may be catching up with Ortiz. •	Over the last three seasons, he’s homered on average once every 15.5 AB; this season he’s homered once every 25.7 AB. •	Over the last three seasons, he’s driven home a run on average once every 5.2 AB; this season once every 8.6. •	Only 7.3 percent of his hits this year are for extra bases, the lowest of his career. •	The shift is killing him. He has a .233 BAbip and he’s hit 50 grounders and only seven have gone for hits (with just one to the opposite field). •	Ortiz is hitting .286 against righties, which is better than the .259 he hit last season, but nowhere near the .339 he hit in 2013. •	He’s hitting .109 vs. lefties, way down from the .275 last season and .260 in 2013. He has yet to draw a walk in 57 plate appearances against lefties this season, and has yet to homer. •	Ortiz is hitting .284 at home this season and has two homers. Last season, he hit only 11 HRs at home, the fewest of Red Sox career. •	Away from Fenway, Ortiz is hitting .163, the fourth-lowest road average in the majors amongst qualified batters. •	In the 20 Sox losses in which he’s played, Ortiz is hitting .229 with one homer and six RBIs. Even when the Sox win, his impact is minimal. In those games he’s hitting .214 with five homers and 12 RBIs. •	From the seventh to ninth innings, this hitter who has been clutch for so long is hitting .075. But it is even more distressing that with runners in scoring position, he has become an easy out, hitting .135 and with two outs and RISP, he’s hitting .133. •	Versus starters, he’s hitting .276, but against relievers he’s hitting a meager .102 and the first time he faces a relief pitcher, he’s hitting .085. •	From 2008 through 2014, Ortiz’s bat has been quick enough to hit .296 against the fastball. This season, he’s struggling at .176. He’s hitting .462 against change-ups. Ortiz has gone hitless in 19 games this season. He hasn’t had an extra-base hit or an RBIs in 28 games. He has 13 extra-base hits this season but has not had more than one in a game. With a rotation that has question marks one through five, the designated hitter, in the heart of the order, is a critical component. But overall, Red Sox DHs are 13th in the AL with a .216 BA, 9th in RBIs (right fielders and catchers are last), and ninth in slugging at .413. 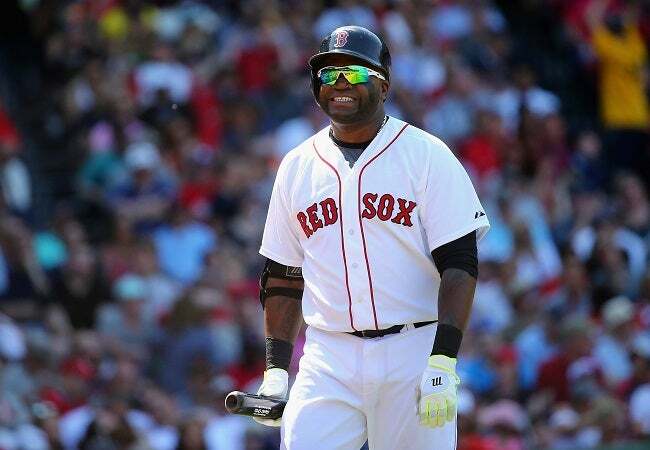 On May 26, 2014, Ortiz was hitting .272 with 12 homers, 29 RBIs and an OPS of .895. On May 26, 2015, Ortiz is hitting .221 with six homers, 18 RBIs and an OPS of .694. What a difference a year makes…what a difference the years make.